HOW DO YOU INVEST IN SOLAR? How to invest in solar: Installing solar does not only have environmental advantages – it can generate healthy returns for your pocketbook as well. You pay PG&E for electricity, but as their rates increase every year, are you provided more electricity? Nope, your payments are increasing for the same level of service. If you could virtually eliminate that payment, what would you do with that cash? Remember, when you invest in solar, you are essentially generating a return in the form of cash savings. Therefore, you could put that cash into a new car, a higher clothing allowance, or whatever. If you put it into a typical stock market investment, you’ll be able to watch it grow over time. 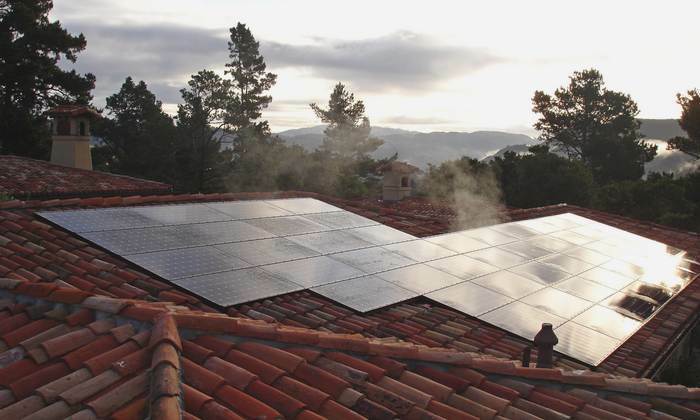 Solar panels, integrated into the clay tile roof. Let’s say your new system costs $35,998 and reduces your bill from $350 a month to $19. After you subtract your tax credit, the savings you generate will pay your system off in about 6 years. It is an added bonus: It’s true that you get a 30% federal tax credit on the cost of the system. However, here’s something you may not know – when you install solar into a new roof, creating an integrated system, you may be eligible for an even greater tax credit. The basic numbers: Saving $331 a month for 25 years totals $99,300. That’s just stuck in the cookie jar, not invested, no PG&E rate hikes, just cash savings. The return on your initial investment in the first year is 15.8%. With utility rate increases, it only gets better, and then the question becomes, how can you really make your cash work for you? For the sake of this article, I’ll be conservative and use a basic 5% rate of return that you might get in a typical investment. At that rate, $331 a month over the life of your system nets you about $200,000. If you drop your tax credit in as an initial investment, that number hits $235,000. Nice. And that’s just with today’s bill. How could anyone speculate on PG&E’s estimated rate hikes per year? This is the most volatile component of the equation. Rate hikes mean even more cash you’ll be paying out for the same service, unless you choose to install solar. If you figure those hikes into your annual investment contribution, the returns are staggering. Roughly, at a 5% per year utility increase, in 25 years you’ve got close to $400,000. Of course, these are estimates, and past performance in the stock market is no indication of future results. But we do know that solar works. It’s environmentally beneficial, and you can bank on the sun rising every day.